Put a link across two of the mounting holes where the ATX power connector would go for MakerBot (just to the right of C). Solder in a 3.3V regulator (78L33) and a 100uF smoothing capacitor at C. The flat on the regulator and the -ve wire on the capacitor are both towards the bottom of the picture. Solder four 2.54mm 2-pin header connectors where the RJ45 connectors would go for MakerBot, as at D and to the left. Make sure you have at least one connector for the SDA and SCL connectors at B. Also make sure that there is a jumper at A (this allows the board to be programmed correctly). 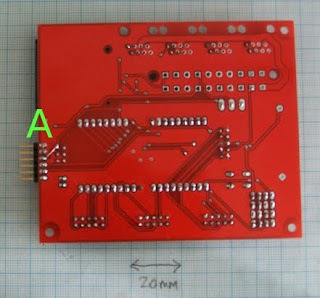 Then put a link on the back of the board as shown at A on the right between the third pin of the serial input (the red wire on the USB connector) and pin 2 of the ISP connector. 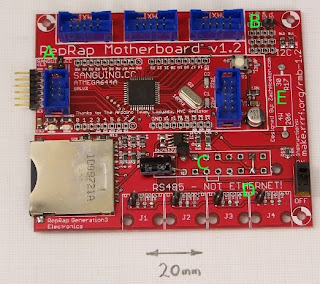 Your board can now be fully powered by the RepRap USB cable.